John Lewis has released its Christmas Ad. This year Elton John takes us on a trip down memory lane and shows us how gifts can change lives. So what makes this Christmas Ad like John Lewis’s other Christmas Ads so special? John Lewis is the master of emotional storytelling. It knows depictions of family, nostalgia and thoughtfulness are guaranteed sharable content. Owing to its consistent approach and use of a strong narrative arc, the British public anticipates John Lewis’s Christmas campaigns with tremendous excitement. 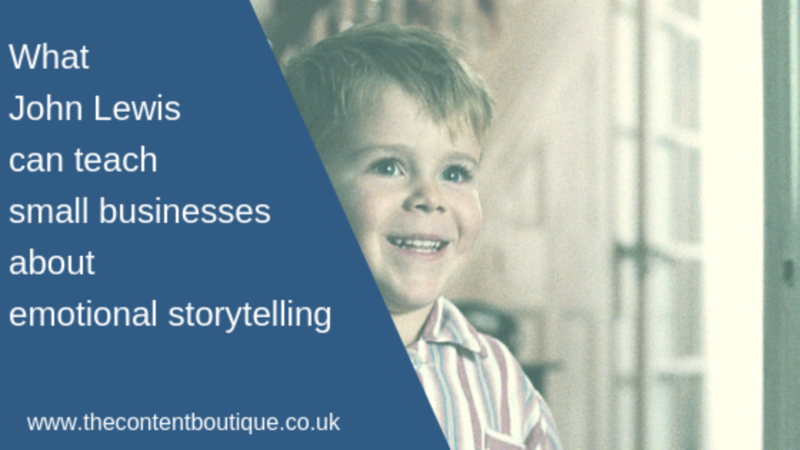 So what can small businesses learn from John Lewis? John Lewis gives its audience precisely what it wants. A thoughtful message. A hero to which the audience can root for and relate. A famous song reinterpreted. John Lewis’s heartwarming campaigns elicit emotion and show the department store’s human face. On the surface, in its 2018 ad, John Lewis appears to have changed direction. No cute furry animals. No animation. But dig a bit deeper, and you’ll see that John Lewis used the emotion “gratitude” as a basis for this ad. It’s a simple tale about a boy and his piano and the gratitude he feels about receiving a gift that stands out from others. People love stories. They’re memorable. They shape what people think about your business. The themes of happiness, courtesy and contributing to the wellbeing of others all flow through John Lewis’s Christmas ads. As a result, with each new ad, the company reinforces its identity. Have you noticed how John Lewis’s products are incidental to its stories? Emotional storytelling is not intrusive. Therefore your audience is far more likely to share it. And as a result, you’re far more likely to build a following. Before launching its ads, John Lewis builds excitement with teasers. Last year within 24 hours of its launch, the “Moz the monster” campaign became the most viewed Christmas ad on Facebook and YouTube. Elsewhere John Lewis uses hashtags (#eltonjohnlewis, #BusterTheBoxer) to make its ads searchable, generate momentum and to encourage conversations. You can see that John Lewis’s Christmas ads tick all Google’s boxes. And keep audiences coming back for more. Whether you sell products and services B2B or B2C, there’s plenty of research to suggest people do not make decisions logically, but emotionally. With emotional storytelling, you aim to connect your brand to the positive emotions your audience is feeling. And as a result, strengthen your relationship with your audience so that it feels confident buying from you. If you would like help writing content using emotional storytelling, then drop me a line to get information about pricing.